Guess what?! I'm teaching at Costume College this year! I'm pretty excited about it, a workshop class to make a late 18th century hooded cape, called "Winter Wear - Hooded Cape workshop.' I submitted a class to teach and they accepted! I've taught classes (Late 18th century muff workshop & Regency Dress Detailing) at a small convention called Dress U and Dress U the second in 2012-2013, but teaching at CoCo is new for me: I've only attended one other year years ago, and this year I'm attending again and teaching a class, yay! It's a 2 1/2 hour workshop, and the class size is fairly small (limited, since it's so hands on). Students will bring their fabric and pre-made binding, and then will get a pattern I created for a late 18th century cape with optional hood and trim options. Students can choose to make a high fashion hooded cape/muff, a more subdued mourning cape, a more practical winter garment & much more: I'm also going to do a brief talk on history of outerwear. I've been so obsessed with outerwear lately, I'm super excited to share the knowledge I've learned about the shapes, history, and how to. It's going to super fun, I can't wait!! 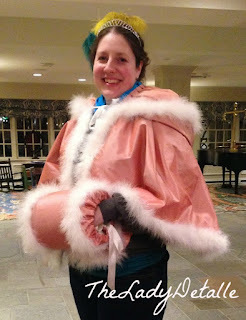 Here's the first late 18th century hooded cape I did: it's pink silk taffeta lined with pink linen and trimmed in white marabou. I'm really looking forward to CoCo and hanging out with everyone, and I'm about to start my Gala outfit and will share my plans on that soon!